This distinctive villa, overlooking Mojacar Playa, has a built surface of 275 sq.m and is located on an 800 sq.m plot in the calm, exclusive villa neighbourhood of La Parata. Surrounded by the area’s characteristic flora and fauna, it offers panoramic views of the sea and the beaches of Mojacar. The villa presents a balanced combination of discrete luxury and comfort. It is built on the slope of a hill and has three levels. The house has a heated pool with a large tiled terrace and porch. A short private driveway leads you from the main gate of the property to two levels of the house: to the pool level with garage and to the first floor with all living areas. You enter the first floor through an entrance hall with on your left a spacious lounge with dining area. This room has double doors that provide access to the barbecue terrace that overlooks the pool and sea. Next to the lounge is a luxury, bespoke kitchen with top quality appliances and access to the barbecue terrace. Opposite the kitchen is the laundry room that leads to a cool patio behind the house. From the patio, an outside staircase leads to the pool area. Next to the laundry area is a cloakroom and at the end of the hall is a double bedroom with full bathroom. On the second floor is the master suite with en suite bathroom, large fitted wardrobes and private lounge terrace. Next to the master suite is a double bedroom that is used as an office space. On the same level is a complete bathroom with bath and shower and another spacious double bedroom with fitted wardrobes and access to a sun terrace. All rooms have frontal sea views. On the top level you walk out onto a large rooftop terrace with incredible views. This is also the place where a solar panel with water boiler is located, as well as the air conditioning units. From the first floor, an internal staircase leads to the garage and pool area. In the garage is a kitchen nook, perfect when hosting a pool party. There is a cloakroom and a large storage area. The garage can easily be converted into two more bedrooms or a studio apartment. The house stands in an elevated position and the spectacular sea views are prominent. You can enjoy them from one of the many terraces and balconies, from each room of the house or from the covered terrace by the heated private pool. The pool has a pool cover and exterior shower. There is plenty of parking space at the entrance of the property as well as a covered parking space in front of the garage. The area around the house is landscaped with trees and flowering shrubs. The house is served by mains water. There is a reserve water deposit for 1.000l, which can be useful for the odd breakdown in the water supply. There is a water purifier installation and an extra pump to increase the house’s water pressure. There is a solar panel for the warm water. The property has mains electricity. In the house, there is gas central heating. The gas is provided via gas bottles, stored outside the house. The house is in top condition, is very well maintained and does not need any renovations. The house was build to the specifications of the current owner with all the comfort to live in the house permanently. Windows have double glazing, mosquito screens, roller blinds and security grills. There is internet connection and the satellite dish receives all UK programmes and more international channels. All doors are solid wood. Floors are ceramic. Hiqh quality building materials were used used throughout. This villa is ideal for those looking for a permanent home or long periods of relaxation in the mild climate of Almeria. This is both a great family home and a property with B&B potential. Access to the property is from a quiet public road onto an asphalted driveway. 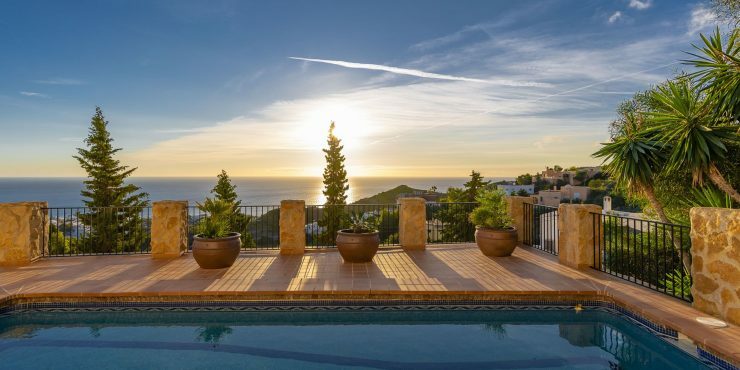 This property is privately set in an exclusive sought after villa area, away from the busy beach life, which is just a few minutes´ drive away, via a winding road. The lovely old white washed town of Mojacar is a ten minute drive. Here you find the weekly market, bars, restaurant, primary school and the municipal pool. In Mojacar Playa, a 5 minute drive, you will find all amenities, a large variety of both traditional Spanish and international restaurants, a high school, banks and private and public doctor’s practices. Mojacar has over 310 days of sunshine a year and has over 20km of beaches consisting of both rocky coves and sandy beaches. Temperatures during the day in winter tend to be around 16-22 degrees and in summer 28-32 degrees. The closest airport is Almeria about 45 minutes away, while the airport of Murcia (130 km) is at one and a half hour and Alicante airport (200 km) is a two hour drive away.